Is your jewelry in a jumble? Here are some great necklace organizer and jewelry storage organizer recommendations along with the step-by-step jewelry organizing process! Favorite pair of hoop earrings? Antique family heirloom? Gift from a loved one? Being organized means you can find these things, quickly if necessary, so time is saved. Being able to locate items means that duplicates are not purchased and therefore money isn't wasted. This also avoids frustration and raised stress levels. Doesn't that sound pretty important? Remember, no project is too small, especially when it comes to valuables. To get started, use the following tips and product suggestions for organizing jewelry. Happy organizing! Utilize the general organizing procedure of purge, sort and store, and use it to organize jewelry. • Start by gathering all of your jewelry. Go through each piece one by one and decide if it is worth keeping. • In order to accomplish this, ask yourself appropriate questions (How often do I wear this? When was the last time I wore this? Is it still in style? Is it in good condition?). • Take out the trash, and put the donations in your car. If you are giving items to friends or family members, put them in a labeled bag by the door to ensure you distribute them. 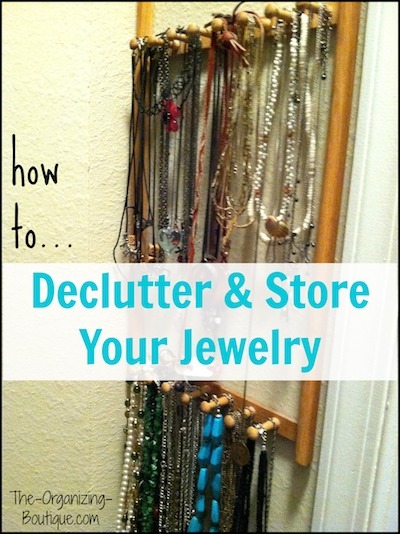 This hinders the possibility of undoing your hard jewelry organizing work. • Now that you can see what and how much you have, separate your jewelry into categories (i.e. earrings, necklaces, bracelets, brooches, rings, good jewelry, costume jewelry, etc.). This is my necklace organizer; any series of hooks will do. • With your jewelry sorted, you can see how much you have of each category. Use organizational products accordingly. See products suggested below. I use this Jewelry Hanger (product link below) to store my earrings and other small jewels like brooches. This product nicely hides my jewelry among my clothing. • After wearing items, be sure to put them back in their rightful homes. • A few times a year, go through your jewelry collection and pitch or give away any unnecessary items. There are some fun, stylish products manufactured just to help you organize jewelry. Check out the ones below! What a product! This jewelry hanger is great for earrings, bracelets, brooches, rings and any other small items. This product features two sides for maximum storage, clear pockets for easy viewing, and can hang concealed in the closet. This necklace organizer hanger does the job! 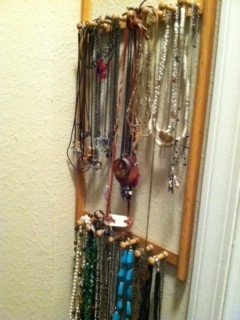 It keeps necklaces and bracelets from getting jumbled and takes up minimal space in the closet. This product is attractive, sturdy and convenient. It would be great for frequently-used items and fits appropriately on a counter top or dresser. This jewelry storage organizer is a fun way to dress up your counter and store your gems. It features swiveling branches for necklaces and bracelets and a recessed base for rings, watches and other accessories. This travel jewelry organizer is great when you're on the go! It features padded compartments for extra protection and a variety of storage options like hooks and loop straps. 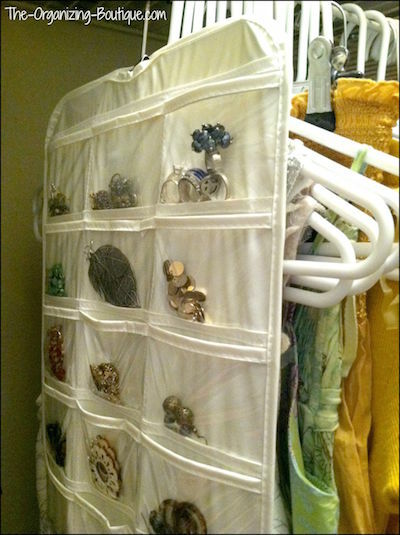 This jewelry drawer organizer is fantastic! It features a variety of compartments to hold jewelry of all shapes and sizes. It is also lined to prevent scratches and tarnishing. Murami jewelry frames solve the problem of tangled necklaces and lost earrings and they display your jewelry with style! If you liked this post, then you'll love this one on 5 different jewelry storage solutions for any space (or lack thereof).